In a period that many would describe as a golden age for television, Jenji Kohan ’91 has created not one but two hit TV shows: Weeds, a satirical take on the war on drugs, and Orange Is the New Black, an equally subversive look at the criminal justice system. Queen of a new, edgier brand of storytelling, the Emmy-winning Kohan has found a way to bring laughs and sharp social commentary to mainstream television. To survive in show biz it helps to have a thick skin. Kohan developed hers around the dinner table, where she tested wits against a family of writers: Emmy-winning father, Buz; acclaimed novelist mother, Rhea; and twin older brothers, Jono and David (co-producer of the ’90s sitcom Will & Grace). In the Kohan household, bathroom humor was dismissed as too easy, and the bar to say something funny and original was set almost impossibly high. “Comedy was serious business in my house,” she says. 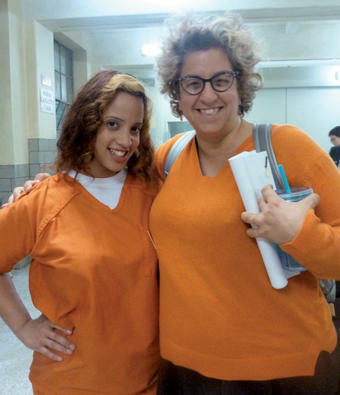 Jenji Kohan ’91 (right) and Orange Is the New Black actress Dascha Polanco (“Dayanara Diaz”) on set at Kaufman Astoria Studios in Queens during a Season 1 filming break. To show her support, Kohan often wore an orange backpack and matching accessories to shoots. One of the things Kohan hoped to figure out was how to break into New York’s spoken word scene. Aspiring to be the next Spalding Gray or Joe Frank, she landed an internship at Franklin Furnace, a performance art space located at the time in TriBeCa, where she ran errands and helped set up shows. While honing her powers of observation off-campus, Kohan concentrated in English and pushed the envelope in her writing at school. Lippit remembers with a hint of envy the “A” that Kohan earned for a paper that used an Elvis bust lamp to launch a discussion of philosophers John Locke and David Hume. In her spare time, Kohan wrote fiction. After winning several contests, she wondered if she might be able to write for TV after Columbia. Her boyfriend was skeptical. “You’d have a better chance of getting elected to Congress than getting on the staff of a television show,” he told her. Undeterred, she drove cross-country and settled with a friend in Santa Cruz, Calif., where she began writing speculative scripts for Roseanne, Seinfeld and The Simpsons. One day she handed her scripts to her sister-in-law’s father, who passed them to a literary agent. Soon Kohan was working on The Fresh Prince of Bel-Air starring Will Smith. Kohan worked on several more shows, including Friends and the sketch-comedy show Tracey Takes On, with Tracey Ullman. Itching to create a series of her own, she wrote the pilot for Weeds, a comedy-drama about a widowed soccer mom turned dope dealer. Kohan says she wanted to do an outlaw show, and that while pot was illegal it was the “funny drug. It served my goals,” she says. Showtime bought it, and across an eight-season run that ended in 2012, Weeds racked up numerous awards, including Emmys for cinematography and sound mixing. The show was nearing its end when a friend mailed Kohan a copy of the memoir Orange Is the New Black, about a Smith graduate who goes to jail for a drug-smuggling stint in her past. Kohan saw in author Piper Kerman the opportunity to create a fictionalized version of the girl-next-door who could bring together worlds divided by race and class. Avoiding formulaic conventions, Kohan has occasionally taken risks that her colleagues have warned against. After lead Weeds character Nancy Botwin burns down her house at the end of Season 3, Kohan insisted on changing the popular theme song, “Little Boxes,” to customized main titles, or credits, signaling the show’s transition to new narrative terrain. It was chancy but as a result, Weeds never got stuck in suburbia, unlike Desperate Housewives, says Beggs. “We say to ourselves at the studio, never bet against Jenji,” he says. There are also few sacred cows in her work. When it comes to getting laughs, all ethnic groups are fair game, not to mention potheads, narcissist moms, old people and gangsters. She is an equal opportunity offender, which is one reason, she says, she will rarely call out colleagues for making sexist remarks. What she will call out is work she considers substandard. “What offends me more than something sexist is something poorly written or unfunny or clichéd,” she told Fresh Air. The sly, antic humor that Kohan brings to her characters can be glimpsed in her public persona, from the cat-eye glasses to the tousled hair often dyed bright, punk-rocker hues. In her most recent Christmas card, she and her husband, writer Christopher Noxon, pose with their kids — ages 8, 12 and 14 — in matching Hoodie-Footie pajamas. Kohan credits Ullman with helping her make the leap from writer to show-runner, a kind-of CEO of the series who controls all creative decisions, from writing to casting to the final cut. The Emmy she won as supervising producer on Tracey Takes On in 1999 sits on her mantle, and to this day, Kohan follows Ullman’s “sane and healthy” management style. By that, Kohan means wine with lunch, no slacking off so that everyone goes home at a decent hour and creating a safe environment that encourages risk-taking. That combination has inspired an unusual degree of loyalty among her crew on Weeds and Orange, where “Jenji’s sets and Jenji’s rooms are happy sets and happy rooms,” says Beggs. In those sets and rooms, Kohan is training the next generation of talent, which will most certainly include more women. For now, she is one of few women to have risen so high. Her main motivation in striving to become the boss, she says, was to have flexibility in raising her family. As for her own creative needs, Kohan says she likes to work in a noisy room, usually coffee shops, with a bag of sunflower seeds and above all, a deadline ticking away. She is working now on a new series about witches in Salem. It sounds like more gloomy material awaiting a humorous treatment but Kohan promises the series will look nothing like what has come before. Listen to an NPR interview with show-runner Jenji Kohan '91. Kim Martineau ’97J writes about earth and environmental science at Columbia’s Lamont-Doherty Earth Observatory in Palisades, N.Y.